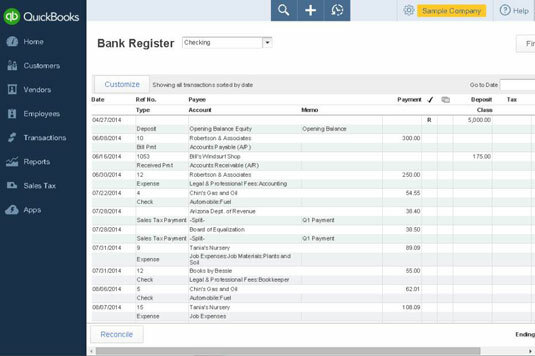 Registers in QuickBooks Online (QBO) look very much like the registers that banks give you along with handwritten checks. Here, you see a bank account register in QBO. The register page displays the name of the account at the top of the register, along with column headings that identify the contents of each column for every transaction. Unfortunately, as you scroll down to the bottom of the register (where you enter new transactions), the column headings disappear from view. You can customize the appearance of the register to help you find a particular transaction. All the transactions in the following figure affect a bank account — along with some other account, as dictated by the rules of accounting (double-entry bookkeeping, a founding principle of accounting, means that every transaction affects at least two accounts). You see these account category types when you add a new account to the Chart of Accounts. In addition, the Chart of Accounts page shows each account and its associated account category type. If you use account numbers, then, generally, all asset accounts begin with 10000, all liability accounts begin with 20000, and all equity accounts begin with 30000. This numbering scheme is not carved in stone, but most accountants recommend that you follow these guidelines when you assign numbers to the accounts in your Chart of Accounts.